My guest today has been involved in over 250 transactions globally, valued from $20 million to over $50 billion. After starting his career in Austria, Thomas Fekete moved to the United States, where he now serves as the Diligence Practice Lead for a private equity firm and heads the teams that conduct strategic financial, operational, and commercial diligence on new investment opportunities. In this episode, Thomas shares his professional journey, as well as what led to his decision to leave Austria and pursue a career in the States. Listen in to hear about his immigration experience, how he built his career up to where it is today, and the important financial lessons he learned along the way. What made Thomas decide to leave Austria and come to the U.S.
His professional journey in the States. What he learned about money from his childhood. Tips for setting goals effectively. The mindset that makes it hard to appreciate success. What Thomas would do if he had unlimited money. Financial topics he’s curious about. His chief sources of info for financial decisions. The best and worst financial decisions Thomas has made. Costs associated with buying property vs. renting. Rules Thomas follows with his money. Sahil Vakil: Welcome, everyone. Welcome to the sixth episode of the MYRA Wealth Podcast. Our guest on today's podcast is Thomas Fekete. Thomas works at a private equity firm, where he leads the teams that conduct strategic, financial, operational and commercial diligence on new investment opportunities. Prior to that, he worked at a consulting firm's deal advisory strategy M&A services practice. He was involved in over 250 transactions globally, valued from $20 million to $30+ billion dollars, and advised on financial, evaluation, operational, and commercial and value creation issues. Thomas's industry experiences include consumer and retail, energy, natural resources, chemicals, financial services, health care and science, life sciences, industrials, and technology, media, and telecommunications. Thomas started his career at a consulting firm and then M&A integration practice in Vienna, Austria. Thomas also holds an MBA in finance and management from the Wharton School, has a master's degree in social and economic sciences and business administration from the Vienna University, and finally, Thomas is the co-chair of Wharton's investment network of the Wharton Alumni Club of New York. 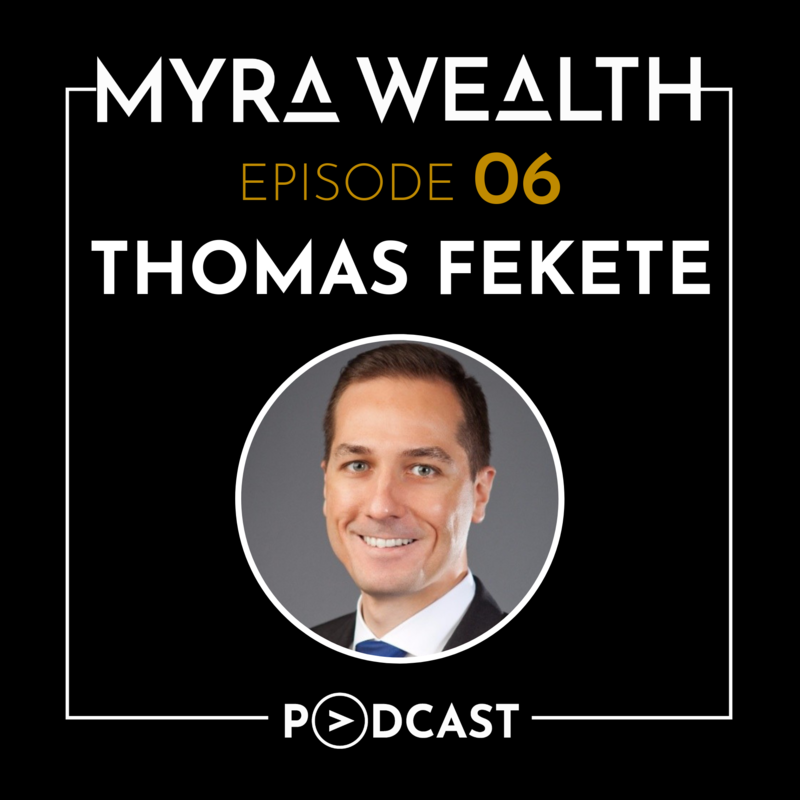 With that introduction, I hope you enjoy this episode of the MYRA Wealth Podcast with Thomas Fekete. Welcome, Thomas. Welcome to the MYRA Wealth Podcast. Thomas Fekete: Thank you much, Sahil. Very happy to be here, and thank you much for the opportunity. Sahil Vakil: Absolutely. It's a pleasure to have you on our show here. And I'm sure our listeners are gonna be excited to hear your story. Thomas, you and I have known each other now for a few years. We went to business school together several years ago, and I know a lot about you already. I know you're from Austria. But why don't you just quickly, briefly introduce yourself? Why don't you just tell us where you're from, where your family's from, and where you're currently located these days? Thomas Fekete: Very happy to do so. So basically, I'm from Austria, near Vienna, which is the capitol of Austria. My family lives probably 25 miles southeast of Vienna in a small village of around 3,000 people, which is where I grew up and spent the early years of my life from being a child all the way through 18, before I moved to Vienna to go to business school in Vienna. The rest of my family is still back in Austria. I'm the only person in the family who moved to the US. Initially, I wanted to spend a year or so in US before I moved back. As now happened, I've been here now for 11 plus years and still enjoy it. And this is basically my background about where I'm from and where my family's from. Sahil Vakil: But that's interesting. You've been here about 11 years, and it sounds like you're a first generation immigrant, in that sense, the first one from your family to have moved to the United States. What brought you to this country? Was it for education purposes? Was it a job that brought you here? Was it opportunity? What brought you to the United States from Austria? Thomas Fekete: No, it was basically, I never had the plan to immigrate to the US or live in the US. I definitely wanted to live in some international setting and in a foreign country for a year or two before I turned 30. This was always a part of my plan when I graduated college back in Austria, and then it just happened that I won the green card for the US in the green card diversity lottery, so this was then basically my chance to move to the US and basically spend ... My initial plan was to spend a year here in the US since I won the green card and wanted to put it to use. So it was basically pure luck that I won the green card lottery, and this basically gave me the opportunity to move to the States and also professionally work in the States, and this was a trigger, basically. I never had it on my list that I wanted to specifically move to the US. I also was happy to spend a year or so in London or Hong Kong or somewhere else in the world, but I think the green card win definitely helped with the decision to try it in the US and especially New York. I always admired New York and definitely wanted to spend a couple of years in New York. Sahil Vakil: That makes a lot of sense. It's exceptionally amazing how a lot of individuals have applied for the green card diversity lottery, and stories like yourself are extremely successful individuals adding to the US economy. Thank you for moving to the United States in that sense. For our listeners that don't know, the green card lottery or the diversity visa lottery is a popular way to become a US permanent resident. Each year, the USCIS makes about 50,000 green card visas available for diversity purposes. They call it a lottery for a reason. Honestly, your chances of winning this lottery are very slim as millions of people each year globally apply for this. Again, the terms are a little confusing. They call it the diversity visa, but in reality, it's actually a green card that they're giving you. In addition, there are restrictions that are based on who and who can not apply. It's typically based on country of birth as well as some certain education and work qualifications, which we'll discuss soon. So just generally, who is eligible? This lottery, the idea behind it, it was created from all the immigration from countries whose citizens were not well represented in the United States. So for our listeners who are from Canada, Philippines, Mexico, India, or China, sorry, but you're out of luck. You do not qualify for this diversity visa program. Also, certain loopholes that exist and have been closed ... This lottery now considers your country of birth and not your country of citizenship or residence. So if you were born, say, in India, and you immigrated to Spain and now live in Spain, you are considered an Indian applicant for this diversity program and not an applicant from Spain. In general, submission of this green card lottery is pretty straightforward. It's actually pretty simple. One, you just need to qualify, and you need to be from a country that's eligible. Two, you need to meet some basic education and work requirements. The education requirement is very minimal. It just requires you to have a K to 12 education. And work requirements are also pretty lenient. They just require you to have two years of experience within the last five years in a job that does require two years of professional training. And then the application is simple. You just go online, and you can apply during open registration period online. If you're interested, I would highly encourage you to visit the website called dvlottery.state.gov. So again, that d-v stands for diversity visa, so dvlottery.state.gov. We'll include this in our show note links as well, so you can access it from there. Let me ask you, Thomas. You clearly grew up for a majority of your childhood and your adolescence in Vienna. You moved here before the age of 30, but pretty much most of your education and your early 20s were in Austria. Do you have any childhood memories or stories as relate to personal finance or money from back home? Thomas Fekete: Well, my family is ... let's call it a middle class family in Austria as we never had wealth as other people had. Money ... Family was always important, and especially budgeting was very important, so I think I grew up in an environment where we were taught very early the value of money and how you can basically plan and budget your spends and which decisions you make on what you would like to buy and what it takes you to save money to get what you wanted to buy. So for example, when I really wanted to go on vacation or when we wanted to buy a new car, there was always a thought process, budgeting process around that in regards to how long we need to save money for that, which investment decisions do we make, what can we afford, what we cannot afford. So I grew up in this type of environment. Then also remember, my grandparents, my grandparents from my mother's side, they were also in this financial planning. So my grandfather was very well versed in the stock market, so he definitely owned a couple of stocks, and he showed me very early on as a 10 year old, 11 year old, on what investments he makes, on which companies he puts in his money, how he monitors those investments, how he follows basically news of those companies invested in. So I grew up in this type of environment where, on one hand money was a scarce resource and we had to budget around that, and on the other hand I got exposed to the investment world by just ... out of my grandfather and having those conversations around how he makes his investment decisions and where he places his bets. So those were the memories I had back from days. We got some money. And then another component, I think, which was probably unusual compared to other teenagers in Austria, I was lucky enough to be a good soccer player, and I happened to play for a team in Austria. And as a teenager, back then, we didn't make much money, but we definitely got some money from playing soccer. So I had my own income starting at age 16 or so from playing soccer. This also taught me the importance of having money, having your own money, and then also making the right investment decisions and not just spending your money on stupid things. So save money, make your decisions, and then basically what you want to buy, and make sure that you thought about that quite extensively before you make the decision. Sahil Vakil: That's some really interesting facts that you mentioned there. So let me ask you this. You were clearly very involved with your family. It seems like they discussed money at home more openly, your parents, your grandparents, they involved you in a lot of the financial budgeting decisions, your grandparents also involved you in a lot of the stock picking and investment decisions. Is this a cultural or an Austria- or a Vienna-based thing where pretty much all families are open about money. Is it in vein of the culture, or is it really just your family? Thomas Fekete: Good question. So I would say it's very entrenched in the Austrian and German and even Swiss culture that, number one, people save money, so you're always taught very early on, you basically have your piggy bank, and you basically save every euro that you get from birthdays and Christmas and Easter celebrations. So there's this culture in the southern part of Europe where we're taught to basically save your money and put your money on a savings account very early on. And also, in the upbringing in the schools, it's being taught that you should save money, and there are even programs from Austrian banks and German banks who come to school, and as a six year old, seven year old, eight year old, they basically educate you on how you should save money, which is perhaps unique. I haven't seen it in the US. But you get basically approached from different angles, from your family, from school, from the society as a whole, to basically save money and only spend the money what you have. So for example, when I moved to the US, my colleagues ... they were back then 25, 26 years old ... and they told me they just bought a house for 400K, and they took mortgage, and they have now student loan and a mortgage, and this was totally a different world for me because in Austria, you would never take a mortgage if you don't need to. So you would first save, and then when you have enough money, you'd probably start building your house, or you buy your house, but you would never take on a mortgage of 200, 300, 400K as a 25 year old. It was just not the culture which exists back in Austria and Germany. So I think it's, I would say, definitely about the culture. And then, of course, in the family setting, some families are more open about discussing with the children budgeting and money, others maybe not, but I would say it's quite common and was definitely not unusual. Sahil Vakil: This is some really good insights that you're bringing to us here. I think, in a lot of cultures, similar to what you mentioned in eastern European cultures, taking on debt or taking on a mortgage was just not ... I think it's more a Western world concept, where the financial markets, they were so much more complex and mature that they basically had a system where you could give out consumer debt to the average Joe in that sense. And I think an interesting point you made was around the fact that you had large financial institutions taking on these corporate social responsibility projects and coming to schools and basically teaching personal finance to children at a very young age. You're right, these programs don't exist in the United States. I think personal finance is not taught at all in any K to 12 program in the United States, and maybe that's one of the reasons as well why several individuals, they come out of a K to 12 extremely educated on several matters which they may not use in their lives, but the most practical aspect of personal finance and money is never taught to them. And on top of that, money sometimes, in a lot of families in the United States, is taboo, and people just don't talk about it as much as they do in other cultures where you're typically living together under one household, you have multiple generations, and this topic just becomes easier to have when you live together from a physical perspective. So Thomas, just walk us through your journey in terms of ... You clearly grew up in Austria. You were educated there. You then moved to the United States. Give us a high level overview of your professional journey here in the United States. Where all have you worked? What type of education do you have? Just high level would be helpful. Thomas Fekete: Sure, happy to do so. So basically, I would like to start off with my education back in Austria, which I think set the foundation to basically also make it here in the US. So I started off with a computer science engineering degree, so I basically learned how to code, how to set up IT infrastructures, how to use databases, how to use the Internet. So I did a five year engineering degree, which I think helped me a lot to think through issues, to approach issues from a more logical perspective. And I think, up to date, I'm still amazed how this computer science degree helps me in my professional career to think through issues and be more structured around problem solving, so it was definitely a great foundation. After that, I went to a business school in Austria in Vienna, Vienna University of Economics and Business Administration. I got my master's of science in business administration and economics, which set me up to basically start at a consulting firm after I finished this master's degree. I joined a consulting firm in Vienna, in their M&A practice. I basically worked there for two and a half years before I had this opportunity to move to New York, so I requested an office transfer, which they luckily fully supported, and they made it happen. So I basically moved to New York in February 2007. I continued at that consulting firm for another three years before I switched firms and joined another consulting firm in the deal advisory strategy M&A practice, where I spent about eight years in more increasing senior roles before, in 2018, I got recruited by a private equity firm to lead a team who conducts due diligence on new investment opportunities. So basically spent probably 14, 15 years in consulting focused on M&A, and now I switched industries, and now I'm in the private equity industry basically. I'm very excited to have made this move, and my education has set me up very well. And you mentioned earlier, I almost forgot, but we met in business school here in the US, so I also went back to school in 2014 to get my MBA from an American university, which definitely also helped me I think to land my current job, which I think in the private equity space, it's definitely beneficial to have an MBA degree here in the States. Probably not so much important in Europe, but here in the US, I definitely saw it as a prerequisite to enter that industry. So this was my education and professional background. Sahil Vakil: Great. That's fantastic. You have an undergrad in computer science and engineering, a master's, actually two master's, one a master's of science and the other one an MBA, and you have several years of experience, and you are in what some people call their dream industry, which is private equity. A lot of young individuals, especially on the international and multicultural side, aspire to be in that industry. Thomas, clearly you're very successful. You're in a senior role now at a private equity firm. What is the personal definition of success for you, and where does that definition come from? Do you feel like you're successful today? Thomas Fekete: Well, I don't feel successful today, but I definitely get satisfaction from reaching my goals. For me, the finish of success is to reach your private and professional goals, and what I mean by that is ... I probably need to tell a little story here. When I graduated from my master's degree in Vienna, I got a book from a friend, and this book was called, or the title of the book was, "How to Get Everything You Want -- Faster Than You Ever Thought Possible," and the author of this book was Brian Tracy. I read the book, and it was very interesting because the book basically told you or taught you how to set goals for yourself for your private and professional life, which I think is important. And up til there, I had my five year plan both for private and professional perspective, and I think the success comes from having achieved those goals, what you have on your list. So for example, one of the main messages of this book was ... A lot of college graduates, when they graduate college, they aim to make $100,000 in compensation as fast as possible, but they don't realize that you should have a well thought out plan to basically reach this goal in three to four years. If you don't have a goal, then it may take you six, seven, eight years. So this was the main sense of this book, which basically told you you need to basically lay out your goals and put a time limit around it and then try to figure out how you can reach those goals. So for example, which jobs do you need to take after college to reach the $100,000 goal? Or which promotions do you need to receive? Or which prize do you need to set in life, both from a professional and private perspective, to reach your goal? So I think having goals in life definitely helps, and in my case, definition of success definitely comes from, I would say, from this book and from this experience that I always set five year plans and five year goals, and then at the end of this period, I definitely reassessed on where do I stand. And I think I never told myself, "Oh, now I'm successful because I've reached four out of five goals," but it definitely gave me a feeling of accomplishment if I was able to achieve some of those goals, and this is how I would define success, meaning reaching your private and professional goals. Sahil Vakil: Now, thank you, Thomas. I think that's great. If you don't mind just sharing the name of the book again, we'll include it in our show notes for our listeners, and they can always get the book from there. Can you just mention the name again, please? Thomas Fekete: Sure. The title of the book is, "How to Get Everything You Want -- Faster Than You Ever Thought Possible," and the author of the book is Brian Tracy. Brian Tracy is an American-Canadian motivational speaker, and he wrote this book probably 20 years ago, and it's still one of the main books which you should read if you would like to set goals or define goals. Sahil Vakil: No, that's great. What you're pretty much talking about is also ... It's goal-based planning. We use the exact same strategies here when it comes to also managing your finances. Where clearly you said your professional goal, one of them as an example is to get to that $100,000 or six figure mark, in a similar way, when we speak to clients, we basically look at what is called goal-based planning or goal-based investing, where we try to identify, what are your short term, mid-term, long term goals, short term being on a scale of one to two years, mid-term being typically less than five years, and then long term being five years or more? And for each of those goals, I think to your point, you need to define them very clearly and pretty much come up with a road map. So it's basically identifying, if your goal is to buy a house, as an example, then what's the value of the house? Which area is it gonna be in? How much money do you need for the down payment? What's the interest rate you're gonna take a mortgage on? Basically figuring out all the different metrics, putting it down on paper 'cause, as you probably also would know, just writing down the goals in a lot of cases is as good as achieving them in 80% of the cases because just writing it down makes you responsible for them. Yeah, that's pretty much some of the philosophy and an approach we use here when it comes to goal-based planning or investing as well. Thomas Fekete: Yeah, I think it helps a lot in life in general in different areas, and financing's definitely one of those areas where goal setting is definitely a key component, especially if you think about retirement planning and planning for big investments in your life like buying a house or sending your kids to college. So I think this framework, how to set goals and how to follow your goals and how to make them happen, I think it's definitely useful throughout life in various different areas. Sahil Vakil: Right, absolutely. Now, Thomas, you mentioned you have always a five year plan ahead of you, so tell us, at a high level, what is that five year plan as of today, 2019? Where is Thomas Fekete gonna be in 2024? Thomas Fekete: Well, I think the truth is, I think I haven't really developed my current plan because my last plan expired about a year ago, and I haven't had time yet to set really firm goals for the next five years. But at the high level, part of this five year plan is definitely, number one, to basically succeed in my new job. I definitely would like to see myself in private equity in five years from now, and I definitely would like to make sure that I can remain in the industry, which is one of the goals on the professional side. Another goal on professional side, I love education, so I definitely would like to get exposed to more of those online education platforms. So for example, last year, I did an HBX, a Harvard Business School Online course, Disruptive Strategy with Clayton Christensen. And this was a six week long course, and it taught you how to think about disruption, and I was very happy about this course. It taught you a couple of new concepts. You got engaged. Your brainpower was able to process new content. I definitely would like to commit to my education, so definitely part of this five year plan is to have at least one class or one course per six months on my agenda. So this commitment to education is basically part of my plan. Then a third piece is definitely, I know, on the private side, I definitely would like to figure out ... Well, first I would like to remain in the US for the next five years. I definitely have this on my plan. But then towards the end of this five year mark, I definitely would like to figure out whether I remain in the US or whether I should think about moving back to Europe. So this is definitely part of my five year plan, to figure out where I would like to end up. It could be that I end up here in the US until I retire, or I move back, but I feel it's critical now in my current phase of life that I figure this out in the next five years, so it's definitely part of my goal setting plan. Sahil Vakil: Couple things I wanted to ask you and clarify though. So one, you mentioned the HBX corporate strategy class. Can you just tell us who that was by so that we can put it in the show notes as well? Thomas Fekete: Sure, so they just rebranded HBX, and they now call it Harvard Business School Online. The course was called Disruptive Strategy, and the course is taught by Clayton Christensen, who is an expert in that space. He is a Harvard Business School professor, has published a couple of books around disruption, and basically, he taught the course. It's an online environment, but you basically get together with students from all around the globe. They put you into this six week program. There's an online platform, and you basically have team assignments. You get to know other students. At the end of that program, you get a certificate from Harvard Business School that you completed that course. Sahil Vakil: Okay, excellent. Now, one thing that really intrigued me, you basically in your five year plan, the first thing you said is, "Succeed at my current role in private equity," and initially, during the beginning of this conversation, you defined success as this feeling of satisfaction. Then you also said you don't feel successful today, so help us equate these pieces? What will help you reach that level of satisfaction which equates to success for you which then eventually helps you meet your five year plan? Walk us through that journey in that sense. Thomas Fekete: Well, not sure I have a good answer for that question, but I've never been a person who feels accomplished or feels that I have reached a certain level to call it success. I always would like to reach for the stars, so to speak, as a good analogy. I'm never happy with this state of professional achievement or private achievement I achieve, so always looking for the next step. And this relentless focus on the next step, the next achievement, I think, makes you never stop and never take a step back and look around and look at your friends and other people who you know and then try to figure out whether you can call yourself a success or not. So I think other people are better positioned to judge on whether a certain person has achieved success or not, but I've never seen myself as doing this self assessment and calling a success if I have accomplished certain goals. Definitely, as I mentioned earlier, I definitely feel some satisfaction and some level of success if I have succeeded in achieving my goals, but I think it's never enough, I guess, and I'm always trying to stretch myself, both professionally and on a private side, to always become a better person and become a better professional and never stop listening. And I think, with that mindset, I think it's really hard to find success and give yourself a round of applause if you ever achieved something and call it a success. Sahil Vakil: Absolutely. You're a humble man, Thomas. In our books, you're successful, and I'm sure in 99.99% of the world's books, you are successful. You work at a high leadership capacity in private equity, a double master's and engineering major. I don't know what else is left. You have accomplished so much already. I think you're just extremely humble in approach. So Thomas, again, this podcast is about personal finance and money in that sense. And so far, a lot of the conversations we've had have been around this feeling of satisfaction, continuous education or lifelong learning, your online education process, your need to potentially move back to your home country or maybe ... and also your focus on relationships, but nowhere in any of these conversations have we mentioned money. So in that sense, is money is not the prime focus, then what is the most important thing money actually gives you today? Thomas Fekete: Yeah, so money has never been the prime focus in my life because I always thought if you follow your dreams and follow your goals and you basically perform well in your organizations you work for, the money piece comes by itself, more or less. So I think if people focus too much on money, I think they're probably mentally blocked to become successful. So I always went through this approach. Do your best. Be the best person. Be the best professional you can be, and money will follow you, or money will be given to you. So that's why I never put too much focus on the money piece, but of course money is definitely important. For me, the definition of money, for me, I need enough money to make my life happen in New York. So as long as I can have a stable life here in New York and have a certain income which allows me to have a certain lifestyle, then I think that's all what I need in my current situation from the money perspective. Basically, it gives you security and independence, basically, to live your life however you wanted to live it. Every person probably has a different definition on how much money you need to live your life in a certain lifestyle. For me, it's basically having a decent apartment in New York, having decent funding to enjoy the small things in life like going out with friends, going to a Broadway show, probably doing a vacation once or twice a year. So this is basically my definition of money gives you independence and gives you some satisfaction by following your dreams and planning your private life, basically. Sahil Vakil: Let's go now on a fun question on the extreme side. So what would you do differently, or what would you do in your life if you had an unlimited amount of money? Let yourself loose over here. Let's hear where you would go with this. Thomas Fekete: Well, it's a very theoretical question, of course, really hard to answer. I always thought if I had unlimited money I would still probably work in a certain capacity and probably in my current job or in a similar job. I think it's important that you keep a certain structure in life, and professional side definitely gives you some structure, so I would probably still continue working in a certain capacity. I would then also probably try to figure out, what can I do with this money? So there are great examples in the world like Bill Gates or Warren Buffett or other philanthropists who basically do something with their money at the time, and they definitely refocused their priorities. So maybe I would probably do that and try to figure out, how can I be most helpful for society as a whole to basically deploy the capital so that other peoples can succeed or can live a healthy life? Sahil Vakil: Got it. That's a very deep thought, and we wish you a lot of success, and we hope that you have an unlimited amount of money someday so that you can better society and basically give back to the world in that sense. On your personal front, you're extremely educated. You're very well versed in the financial services industry. What personal finance topics are you curious about today? Thomas Fekete: Well, top of my mind is definitely retirement planning, and I'm still trying to figure out how much do I need to have saved at age 65 or 67 or 70, whatever, when you retire to basically have a financial independent life after your retirement. So it is definitely top of my mind, retirement planning. And then the other component is definitely trying to figure out the situation on ... I probably would like to buy an apartment or something like that in the near future, so I'm definitely trying to figure out type of money I need to have saved, what type of ... As I mentioned earlier, I'm not a huge fan of debt and mortgages, but I think the real situation here, especially in New York, is that you probably cannot get around buying an apartment without getting third party financing, so definitely looking at that and trying to educate myself on what the different options are. So those, I would say, are the two main priorities currently from a financial planning perspective in my life. Number one, retirement, and number two, how to build a real estate portfolio. Sahil Vakil: Right, and I think for a lot of folks in Manhattan, your point, buying a home in Manhattan is just a major obstacle, a challenge. We have clients all over the country, and we typically recommend that when you buy a home, you should basically, to be comfortable and not be in a difficult situation with your debt, you should take up to 2.5 times your annual income should be the maximum value of your home. So if you earn $100,000 as a household, the maximum home you can afford should be about $250,000. If you go above that, you're probably overstretching. But in Manhattan, at that point, you can't even get a studio. So we've run some numbers, and we've actually realized that the real number for Manhattan is actually 3.75, and we are actually comfortable recommending to our clients that you can go up to 3.75 times your annual income, and you can still be comfortable. Just because the housing market is a lot stable, there's a potential for price appreciation that you may not see in other parts of the country. So if you are a household living in Manhattan earning $100,000, you can afford a $375,000 home. And obviously, do the math as you earn higher numbers. So hopefully, that gives you a little bit of perspective. In terms of debt, typically what we've seen is banks require a couple of different aspects. So one aspect is a credit score. For a lot of first generation immigrants that have come to this country and that have been here for less than 10 years, they may not have a strong credit score, but those that have been here for more than 10 years potentially have a good credit score. A credit score of 780 and above typically gets you the best interest rates on your loan. Banks also look at what is called a debt to income ratio, where they expect your debt declaration to be 40% or less. What that pretty much means is, if you make $120,000 a year, divide that by 12, that's $10,000 a month. Your mortgage ... All your outgoing debt payments cannot be more than 40% of $10,000 or more than $4,000. And then the final ratio banks look at is what is called a loan to value ratio. And pretty much what that is, they want a loan to value ratio of at least 80%. What that means is you need to put a 20% down payment, or you can have an 80% loan. So I think if you satisfy some of those pieces, you can definitely buy a home in the city. Thomas Fekete: Oh, that's interesting knowledge. I definitely haven't heard about those different ratios. That's quite useful. Thank you for sharing. Sahil Vakil: Absolutely. Thomas, just moving forward, today, what are some of your chief sources of information for your financial decisions? Are you using primarily Google? Is it CNN, CNBC? Is it the Wall Street Journal? Is it friends and family? What are your primary sources today? Thomas Fekete: Yeah, so I would say I use different sources. I have a subscription with Wall Street Journal, which is very useful to get up to speed on the general market environment. I also have a Yahoo! Finance news alert set up. So I basically selected a couple of industries and a couple of companies for which I get news feeds, which is very helpful to get up to speed and stay relevant. Then I also use other publications, like Barron is a very good publication with investment ideas and how you can basically deploy your private capital and invest it. Recently, I spoke to a couple of financial planners, although I haven't hired one yet, but I definitely took the opportunity for a coffee chat or for a call just to pick their brain on how to make the right investment decisions. At the end of the day, I haven't really hired any financial planner because I still would like to figure it out by myself, but it's definitely good to talk to those type of people if the opportunity exists. And sometimes they'll reach out to your LinkedIn, or sometimes they'll reach out to you because they work with other clients of your company. So I would advise, definitely take those calls, and even if you only talk for 30, 40 minutes with those people, you get some ideas, and I definitely got some ideas by talking to those financial planners. So definitely take the call. You don't need to hire them as your financial planner, but it definitely helps if you pick their brain and talk to different financial planners from various companies. Sahil Vakil: Absolutely. Knowledge sharing is extremely important, and you'll notice in the industry in general, in the financial planning industry, and we're part of that as well, is you'll notice people are very open in educating and spreading the knowledge and spreading the wealth as it relates to learning about personal finances because again, as we discussed earlier, it's not taught anywhere in the schooling system in the United States, so there's such a huge gap that exists between what people should know and what they actually know. Absolutely, pick up the phone and speak to an advisor. Even if you don't want to hire them full time, I think you'll get some good, valuable information there. So Thomas, just moving into a fun section here. I'm gonna ask you maybe about five questions. If you can just, in a short description ... maybe give a short story or just a short anecdote ... your responses, we'll call this the rapid fire section, and we'll go with that. Are you ready? Thomas Fekete: Let's do it. Sahil Vakil: All right. So what has been your best financial decision to date? Thomas Fekete: Yeah, so back in 1999, I invested in a technology company called Intershop, which was a German-based company who basically offered e-commerce solutions for enterprises. And I invested my money, and within six months that investment grew seven times. I was very happy and lucky in this regard. And I basically was also able to sell off this position before the big rush because I wanted to buy a car. So it was not that I had a great insight or any knowledge that the crash will be forthcoming, but I just needed the money, so I sold the position, was able to buy a car, and up to date I think this was my happiest moment with money, just seeing this investment grow seven times in six months and then cashing out. Unfortunately, this company went bankrupt a few years later, so I think it wasn’t a great long term investment strategy for this company anyway, but definitely was able to get in and out in the right time, and it was definitely up to date one of the happiest moments I had with money. Sahil Vakil: Okay, fantastic. I think you even got my next question 'cause my next question was, what is your happiest moment? So it sounds like this was not only your best financial decision 'cause you made seven times in six months, but it was also the happiest 'cause you got to buy a car from it, so double whammy there. Thomas Fekete: Yeah, so it's definitely double value. And I think I got more lucky than I had any market insights, but it turned out well, eh? Sahil Vakil: Absolutely. Okay, so then moving on to question three. What has been your worst financial decision? Thomas Fekete: I think my worst financial decision has been that I haven't invested in an index fund such as the Vanguard S&P 500 earlier in life. So I think it's a relatively secure investment and provides good returns. And I think I still regard that as one of my worst financial decisions, that I haven't really spent much more time in educating myself about those type of investment opportunities. So this is definitely one. And I think the other one which I definitely regard as a very bad financial decision is that I'm still renting here in Manhattan, and I haven't bought an apartment yet. In hindsight, I should have already bought a small place. Back in the day, when I moved to the US, especially in 2007, 2008, the real estate market was down. I should have already bought back then. And right now I feel that money is being thrown out of the window because I'm in this rental setup. So this is probably another bad financial decision I have been doing and haven't corrected yet, but I would like to correct it soon. Sahil Vakil: There's definitely some interesting materials we can share with you on the buy versus rent piece because a lot of people do feel like, renting in Manhattan or renting in any expensive city, they are throwing money out of the window, but if you actually sit and do a comparative study, there are a lot of components even in the home buying purchase where you are actually throwing money out of the window. To give you a comparison, from the rent side, you just see this one big rent check going out. You feel like, oh, my god. I'm just throwing out numbers, but if you pay a $5,000 rent, you're like, "I'm paying $5,000 a month. It's rent that's going to waste. After 12 months, that's $60,000 a year." But if you basically compare to an equivalent home that you would buy, there are several pieces. So one piece as an example is real estate taxes. Well, that is also throwaway money when you own a home. You do get a certain amount of tax deduction on it, but the real estate taxes is one large piece. A second large piece is your interest payments on your mortgage. Again, that's a throwaway item. The third piece is your HOA fees that you might be paying. The fourth piece is homeowner's insurance. You don't realize you'll end up paying a pretty substantial amount of homeowner's insurance versus rental's insurance, which is really cheap. The fifth thing typically also is your broker fees. What people don't realize is, when they buy, they don't pay a broker fee typically because that's incorporated in the price. When you sell, the broker fee is almost 6%, and if you stay in a home for only six years, you can equate that to about a percent a year. So if you'll end up buying a million dollar home, that's almost $10,000 right there per year that's a throwaway expense as well. There are several factors, again, if you compare apples and apples, there are a lot of throwaway costs on the buy side as well that we don't realize because they are parceled out or piecemealed in a sense where, versus rent, you see this big, large chunk going out. I think it'd be interesting to do a study on your personal, specific home as well as your rental and then see which one makes most sense from a home buy versus rent perspective. Sahil Vakil: So I think we took over that rapid fire round, but I think the last question I had for you, actually, two questions we had left on this rapid fire ... So one was, what has been your most unhappiest moment or story as it relates to money? Thomas Fekete: I don't have any, to be honest. Nothing comes to mind at the moment. So I'd never had any unhappy moment with money. Sahil Vakil: That's fantastic. That's good to know. And then finally, the last question, do you follow any rules with your money? I know you mentioned a couple in the beginning. You said, save as much as you can. Don't take on debt, so no student debt, no mortgages. But what are some of the other rules you potentially follow with your money? Thomas Fekete: Well, that's pretty much the rules I follow. So definitely don't spend more than you have, develop your own savings plan, and don't take on debt unless it's absolutely necessary. I think, living by those rules basically my entire life, I think it's served me well up to this point, so those are the main rules I follow. Sahil Vakil: Great. Fantastic. I know, Thomas, you're a very future-oriented person. Clearly, you had a five year plan, and you laid it out for us. You mentioned those three or four aspects you want to focus on in the future. But let's take this five year plan and project it out for maybe 50 years. Personally or professionally, in your lifetime, let's say, 50 years from today or 100 years from today, how might you want to be remembered someday, or what are the things that you want to do in this 50 year horizon that basically will establish your legacy as Thomas Fekete? Thomas Fekete: Well, it's a very philosophical question. I haven't put much thought into that yet 'cause I'm still busy with my five year plans, and I think I still need to work on my 50 year plan. But in general, I think, when I look back on my life in 50 years or so, I definitely would like to be remembered as a nice, decent, down to earth guy who helped and coached others along the way to fulfill their own dreams. I get a lot of satisfaction out of coaching people in regards to either professional or personal decisions. And it's also probably part of my family's background. They're all teachers, so we love to teach and coach. So I definitely would like to be remembered as someone who helped others succeed and others to fulfill their dreams. Sahil Vakil: That's amazing. This again comes back to your definition of success, of being extremely satisfied with what you're doing. It's also around your entire plan that you currently have. It's all there on paper. It's all around relationships, it's all around mentorship, coaching. That's fantastic. I hope you become extremely successful and have unlimited amount of money, again, going back to your dream of giving back to society, and I really hope that you do give back in a big way to society. With that, Thomas, I'd like to thank you for giving us some insights into your personal and professional side today. I think our audience has really enjoyed this conversation, as have I, and we thank you for being on the show. Thomas Fekete: Thank you very much for the opportunity. I certainly enjoyed it and learned a few things along the way. Thank you to your excellent financial advisory knowledge. So I definitely got some great information out of this conversation, and pleasure to be part of your show here. So appreciate that.